Dan Christian said Melbourne Renegades' victory in the Big Bash League final had undoubtedly been one of his career highlights. The Renegades veteran lifted the trophy at Marvel Stadium after a 13-run win over Melbourne Stars. 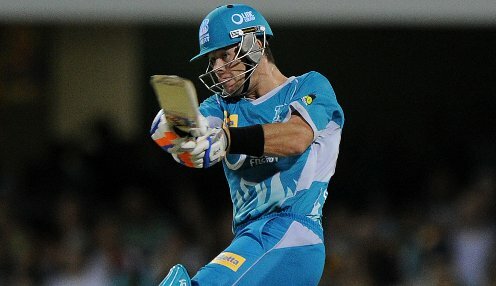 Christian's side were able to defend their total of 145 despite the Stars' opening pair combining for 93 runs. The all-rounder has now won seven domestic T20 titles on four continents and played a key role in the win just two days after being the Renegades' hero in their semi-final victory against Sydney Sixers. Christian and Tom Cooper shared an unbeaten 80-run stand that gave the Renegades enough to defend. He then had success with the ball, playing an important death-bowling role to remove Seb Gotch and Dwayne Bravo. The Stars lost seven wickets for 19 runs, leaving Christian savouring the Renegades' achievement in difficult circumstances. "At 93-0, looking over at their bench and knowing they still had (Glenn) Maxwell, (Peter) Handscomb, (Nic) Maddinson, Dwayne Bravo and those sorts of blokes still to come, we were staring down the barrel," he said. "You take a couple of wickets and you never know. And sure enough, we just kept taking them - it was an extraordinary half-an-hour." The 35-year-old, when asked where his latest T20 title ranked in his collection, added: "Right up there at the moment - particularly coming back like that. It's a testament to the guys and the way they've gone about it all year." Christian, who played the last of his 35 limited-overs matches for Australia in a T20 against India in October 2017, feels he can get back into the international reckoning ahead of next year's Twenty20 World Cup to be held on home soil. Meanwhile, Australia are 11/8 to win their first Twenty20 international against India, who are 4/7. Australia are 4/1 to win the 2019 Cricket World Cup.